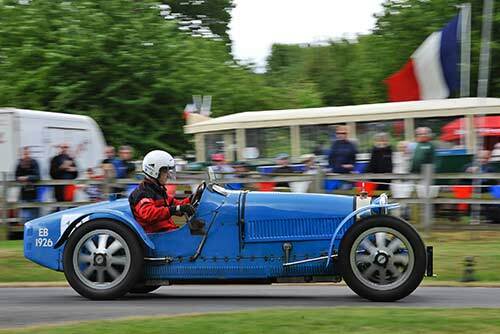 The annual French invasion of ‘La Vie en Bleu’ (Life in Blue) returns to Prescott Hill Climb on Saturday 24th and Sunday 25th May 2014. This year sees many of its regular competitors plus some wonderful surprises including Amilcars, fresh from their UK rally, Voisins including the hill climber and Gerin, and a regular London to Brighton entrant – a Panhard Levassor with a 4 cylinder engine and tonneau body. And if those cars have wetted your appetite Jack Barclay have confirmed three Bugatti Veyron’s. Here is your opportunity to ‘get up close’ and witness its unforgettable sight and sound of one of the rarest and fastest cars in the world today. Plus, each day, one lucky visitor that participates in the Friends of Prescott raffle will win a memorable ride in a Veyron. The Super Sport version of the Veyron is considered the fastest street-legal production car in the world and boasts a top speed of 431.072 km/h (267.856 mph). It was named ‘Car of the Decade’ for 2000 – 2009 by BBC television’s ‘Top Gear’ programme. Roland Duce will be competing in his beautiful Delahaye 135M, and also thrilling us with his Bugatti Type 57. The original T57 and later versions were designed by Jean Bugatti and were built between 1934 and 1940, with 710 being made. Roland’s ‘type 57’ features exotic bodywork was designed by Gangloff in the early 1930’s; however nobody was brave or rich enough to place an order. More recently the owner of a type 57 chassis took the plunge and got one built. Amazingly, the original designer (now in his nineties) came over to England to supervise the build. Popular driver Richard Scaldwell will be plying his 1919 wood GN cycle car chassis and ET Willows 1908, 5112cc/3111 cui JAP V8 up the climb hoping to ‘shave’ off some time. Watch out for this GN JAP Grand Prix special. Then there’s distinctly French-themed entertainment, with the beautiful and talented can-can dancers, live music, a Parisienne 1920’s Renault bus, an accordion player – reminiscent of Monsieur Alfonse played by Kenneth Connor in the 1980’s television show ‘Allo Allo’; ‘Le Shopping’ – a French style shopping village with food, art, and of course French berets. Other treats in store include – De Dion tricycles, Les Grands Routiers “Delage & Hotchkiss” and a plethora of rare and eclectic cars, and of course Bugatti’s with Bugatti gravity racers on display – T35 and tank and the Bugatti trust will be open both days of the festival.